The 2010 Fifa World Cup draw which took place tonight is expected to mark the start of a surge in corporate hospitality bookings for the UK companies appointed as official sales agents. England's first group match, against the USA, will take place at the Royal Bafokeng stadium in Rustenburg on 12 June. The team will then travel to Cape Town to play Algeria on 18 June at the Green Point stadium, and play their last group game against Slovenia at Nelson Mandela Bay, Port Elizabeth, on 23 June. 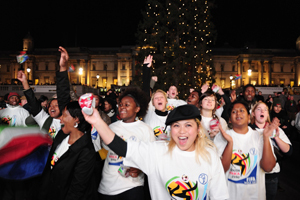 London's Trafalgar Square was buzzing as members of South African Tourism joined an estimated 600 fans to watch the draw live on giant screens. They performed a traditional 'Diski' dance in celebration. Sportsworld, which was appointed as an official sales agent for the World Cup in September, is keeping its ticket office open over the weekend to deal with a widely-predicted peak in enquiries. The agency's CEO Chad Lion-Cachet said: "Over the last few weeks sales have picked up and we hope that sales will continue to be strong after the draw. Businesses can really capitalise on this opportunity to woo business prospects, connect with key stakeholders or reward high-performers." The tournament is expected to provide a long-lasting boost to the South African economy. Earlier this week, South African Minister of Tourism Marthinus can Schalkwyk told a press conference at EIBTM in Barcelona: "When the first soccer match of the 2010 Fifa World Cup kicks off in South Africa, it will be the culmination of years of dedicated effort, planning and commitment. Long after the whistle is blown at the last match, South Africa and Africa will continue to reap the rewards of its investments in this tournament, which has catalysed huge developments."